Eyam Memorial Service. Eyam, Derbyshire England 1973. Last Sunday in August. In August 1665 the bubonic plague, known as the Black Death arrived at the house of the village tailor George Viccars, believed probably to be via an infected parcel of damp cloth delivered to his workshop from London. On 7th September, George Viccars, was the first plague victim in Eyam. 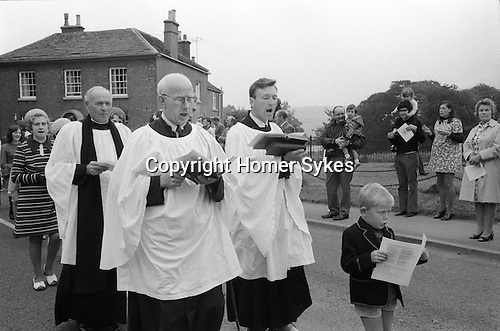 On the advise of the rector William Mompesson and the previous incumbent Thomas Stanley, villagers imposed a strict curfew on themselves, and lived within the boundary of the village. To minimise cross infection, food and other supplies were left at both boundary stones, or at Mompesson's Well, some distance from the village. The Earl of Devonshire, who lived nearby at Chatsworth House, donated food and medical supplies during the fourteen month self-imposed quarantine, which did, successfully contain the spread of disease. Approximately 260 members of the community died out of a population of 350. During this time members of families buried there own dead, and church services were held outdoors at nearby Cucklet Delf. The self sacrifice of the villagers prevented the plague from, no cases of the disease were reported outside of the village. Since 1905 Plague Sunday has been celebrated to commemorate the sacrifice the villagers made. A procession led by the village rector walks from the Parish Church of St Lawrence to Cucklet Delf where a memorial service of commemoration is held and the plague hymn is sung.